This blog is about this and that. Meteorologist: Gulf Stream weakens to lowest level in five years…may bode ill for Europe’s winter! There are 2 videos and about 17 links in this article. ……………. Before the world opens the champagne to celebrate the death of GMO and its paired herbicides such as Roundup, it is worthwhile to look more closely at what was officially said and what not. Both statements are worth closer attention. ……………. Yet for most of the world who don’t have time to research the official statements of Monsanto but merely glance at a Reuters or TAZ headline, the message has been delivered that Monsanto has given up its EU effort on proliferating its GMO seeds. The timing of the TAZ interview is suggestive of what seems to be a carefully orchestrated Monsanto PR deception campaign. ……………. Related articles here on this blog can be found on this page. According to predictions of the French Canal Meteo, there is a 70% chance of a complete absence of summer in Western Europe this year, making it one of the coldest and wettest summers since 1816 – almost 200 years. 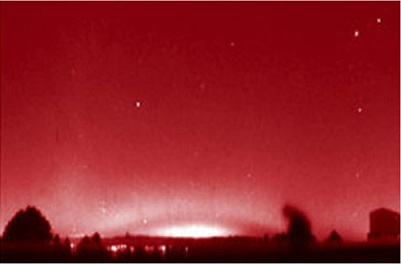 Glowing red arcs invisible to the naked eye have now been detected high above most of Europe using advanced cameras pointed at the sky.